Do more with Google Latitude! When we launched Google Latitude a couple of months ago, we were flooded with feature suggestions. 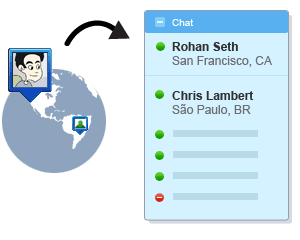 One frequent request was to allow you to share your location with even more people and not just your Latitude friends. Today, we're launching two applications that do just that! 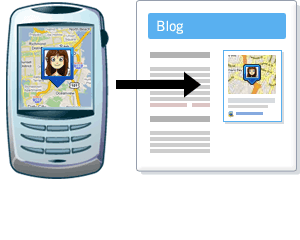 Google public location badge lets you publish your Latitude location on your public website or blog. You can just embed the standard badge -- like this or you can use the KML or JSON feeds directly. Read more about the badge on our Blogger Buzz. When you enable this application, your location will be shared publicly and you will not be able to control who can or cannot see it. For your privacy, you may choose to share your best available location, share only your city-level location, or simply never enable the badge. Google Talk location status (beta) lets you share your Latitude location with all your Gmail chat and Google Talk contacts. It will automatically update your status message to your current city as you move, and anyone who can chat with you will be able to see this location status. Of course, you can easily change back to your custom status message at any time. Visit google.com/latitude/apps to enable these applications. They are two separate apps, so you can select which one(s) you'd like to use and customize exactly how you'd like to share your Latitude location. You must be an existing Google Latitude user; if you're not already, you can sign up here! Please note that we take your privacy very seriously, and your location will not be shared with any application without your consent. Both apps adhere to the same terms and conditions -- you must explicitly opt in to the application and of course, you can always disable an app by going back to the app's page. These applications are only available in the US for now, but they'll soon be ready for all the same languages and countries that Google Latitude supports. Hope you enjoy these, and stay tuned for more Latitude goodies. Also, we love feedback, so please tell us what you think in our Help Forum or suggest ideas for apps on our Product Ideas page (be sure to include "Latitude" so we can search for them!). Does it work on iPhone yet? I still just get "Coming Soon". It doesn't need to set my status to include the State & Country as well. My current City would be more than enough for me. Please let the user choose whether he wants to display the State & Country as well. iPhone or latitude doesn't even exist! I wish that I could put the location widget on my Google Profile. Personally, I think it's great to have the option to share accurate location data publicly, but I'm also extremely worried. I think to be responsible, Google should require age verification (>15.. 18?) to enable anything more specific than city-level location sharing. I don't think the full impact of the word "public" is apparent to people yet. If this isn't for the iPhone, then what IS it for? I agree with Jeremy. The full impact of being public is not known to the public and you can end up showing your movements to people you do not want to. This is dangerous and can have consequences for some people. Very nice, but I'd like to see it generate a "key value" when a user enables public sharing, and possibly allow multiple key values. How would this work? Let's say I have a private social networking profile page and a job with several remote branches that I'll be visiting. I can create one key value on the social networking site, and that key will include an entitlement to my city level data. I can create another key value for my work intranet site, and include best available data. When I'm done with work travel, I can kill that key. End result, I keep my city level badge live on my social networking site, and I get to share added information with my co-workers only during the time when its needed. Hi I'm really sad the loads of J2ME enabled phones are snubbed by the latest version of Google Maps for Mobile. Can you please take a look on it? my W705 phone is stuck with 2.3.x. Furthermore it would be nice if you divert map info from whatever you are pulling it from in my country (Philippines) to mapmaker. The current map user data is unmoderated and there are some lewd language posted there. Mapmaker by contrast is moderated. The IPhone does not currently allow applications to be run in the background. So latitude would be worthless in finding out where a friend is in real time, becasue you would have to open the app for Google's servers to even recognize you. Another iphoner waiting for the app to be released on the iPhone. Is this an open API is anyone else working on something until the official release? I would be willing to use a workaround until the official app drops. iPhone app iPhone app iPhone app... please? what about apps on instinct? Any ideas on when we will see this? I would love if google did this and so would all instinct owners. Please help us!!! Works great for blackberry. You can decide if you want 2 be shown or not. It works even if your phone doesn't have GPS using tower triangulation. Very cool. I'm in the airforce so me and people I have met thru out the world keep in touch with it three.30.ci@hotmail.com. Is how 2 find me with it.